Running is fun, but not when your legs hurt. Running with a heel strike landing is by far one of the best ways to cause lower leg pain and even the occasional tibia stress fracture. 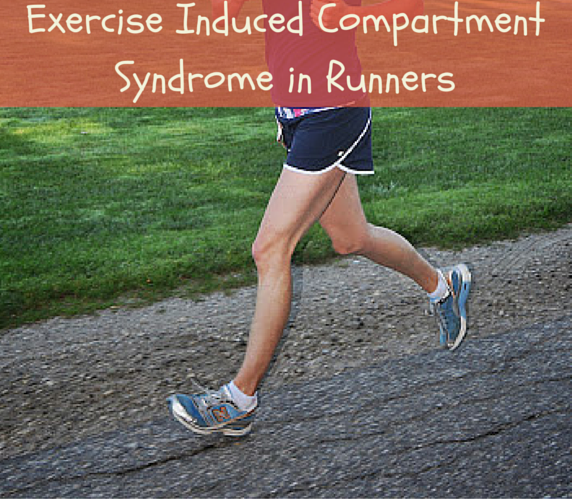 In runners who heel strike, there are 2 factors that may increase their risk of exercise induced compartment syndrome: full knee extension coupled with full ankle dorsiflexion at touchdown. 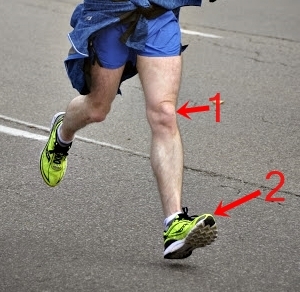 Landing with a heel strike when running (shown below) is an underlying mechanism that increases anterior compartment pressures of the lower leg when using a heel strike running style. How Heel Strike Causes Compartment Syndrome of Lower Leg. (1) Full knee extension and (2) full ankle dorsiflexion upon and at touchdown. Moreover, in heel running, greater anterior- posterior braking forces and vertical ground reaction forces are higher at touchdown compared to forefoot running. The braking and ground reaction forces exacerbate the rise in compartment pressure of the lower leg during heel running. In contrast, Diebal et al. found that forefoot running completely eliminated compartment syndrome of lower leg because of less ankle dorsiflexion and higher knee flexion at touchdown (shown below). Ultimately, higher plantarflexion (i.e. less dorsiflexion) at touchdown in forefoot running provides the most solace for the lower leg. Because humans did not evolve to heel strike during running, the high compartment pressure responses are generally lifelong if the runner continues to heel strike. Divert C, Mornieux G, Baur H, Mayer F, Belli A. Mechanical comparison of barefoot and shod running. Int J Sports Med. 2005;26(7):593-598. Gershuni DH, Yaru NC, Hargens AR, et al. Ankle and knee position as a factor modifying intracompartmental pressure in the human leg. J Bone Joint Surg Am. 1984;66(9):1415-1420. Kirby RL, McDermott AG. Anterior tibial compartment pressures during running with rearfoot and forefoot landing styles. Arch Phys Med Rehabil. 1983;64:296-299. Zifchock RA, Davis I, Hamill J. Kinetic asymmetry in female runners with and without retrospective tibial stress fractures. J Biomech. 2006;39(15):2792-2797.